Design | Build | Remodel | Glenn Gingrich, Inc.
Kevin, a designer at Horizon Kitchens, insisted that Phil call me; I was the person Phil needed to execute the kitchen remodel Kevin had designed for his carriage house in Lancaster City. The structure had been converted into a residence in the 1960’s, and the kitchen dated to that time. The space is small with no viable opportunity to expand the square footage. Kevin’s design maximized the available space. Phil has a strong sense of style and an extensive knowledge of antiques. We collaborated to refine the design, and select all the finishes and products for the project. In the process we became personal friends and continue to upgrade his house with custom furniture and other smaller projects. Crow bars, screw guns and hammers gutted the kitchen and removed the outdated low soffit. The new cabinet height of eight foot one scales nicely with the nine foot two ceiling. 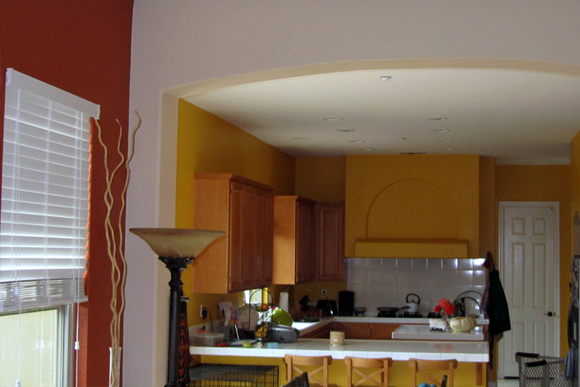 The space above the cabinets was filled with a set-back soffit and a continuation of the room crown molding. The island is a piece of furniture with English style legs. One leg was built hollow to allow electric for an outlet. 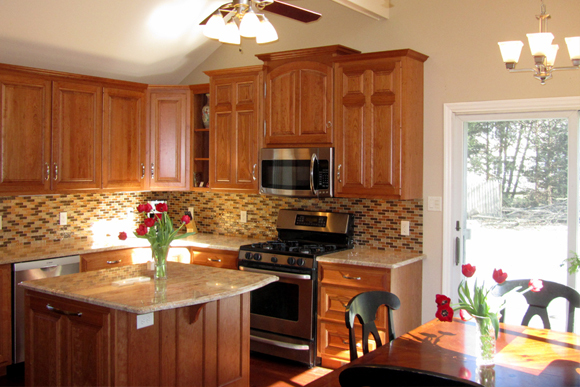 To minimize the impact of the fridge we paneled the side and the doors to match the kitchen. The dishwasher is also paneled to look like the rest of the base cabinets. The backsplash is random width v groove boards painted the same color as the soffit. The boards are set up on a 3/4” plastic molding so that moisture does not affect the paint over the coming years. In another nod to practicality we stood a piece of the counter stone upright behind the induction cooktop. Things are not always what they first appear. To balance the drawer bank on the other side of the kitchen we created false drawers on the trash pullout. 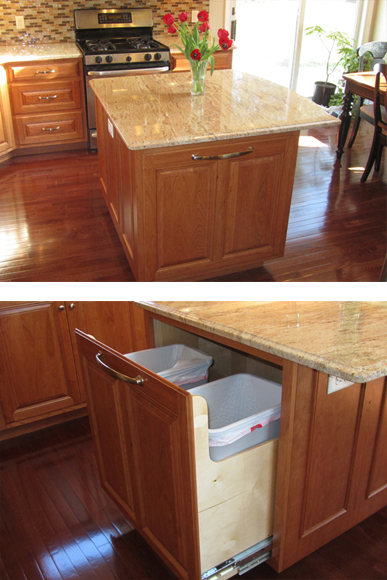 A pullout drawer under the sink allows the owner to get to the cleaning products in the back of the cabinet without having to get down on his hands and knees. Lemans pull out units by Hafele allow access to the blind corner cabinets. I consider hardware in the kitchen to be jewelry. We selected a beautifully detailed knob for all but the glass door cabinets; there we used this rat tail latch which I love. We decided to leave this whimsical iron hook projecting out of the original bead board ceiling. 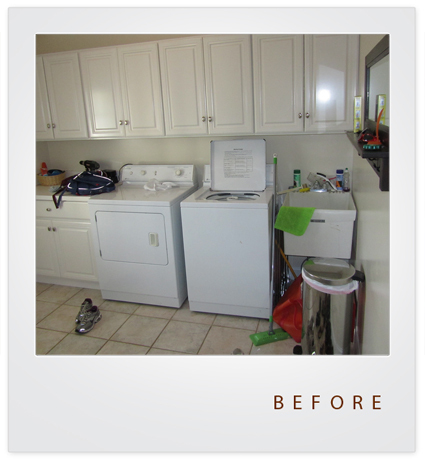 The laundry is located in an uninsulated brick room down a short hallway off of the kitchen. Phil left the door open to allow natural light in to the hallway. It did not take me long to determine that the cold air wafting around the first floor originated in the laundry. The door needed to be kept closed. To keep the hallway from feeling like a dark hole we removed the wood panels from the door replacing them with tempered glass. I paid my way through college working in theatres doing a lot of lighting work. It still amazes me the improvements that can be made to architecture with good, layered lighting. Even during the day this painting comes alive with the addition of two MR16 spots, the effect is even more dramatic after sundown. The entrance to Phil’s house is through a beautiful garden courtyard. The gate however left a little to be desired, both functionally and aesthetically. The new custom gate and posts are constructed out of Azek. The arc across the top supports an antique horse head weather-vane and also braces the post to keep the gate latch in alignment. Another antique accent in the courtyard. 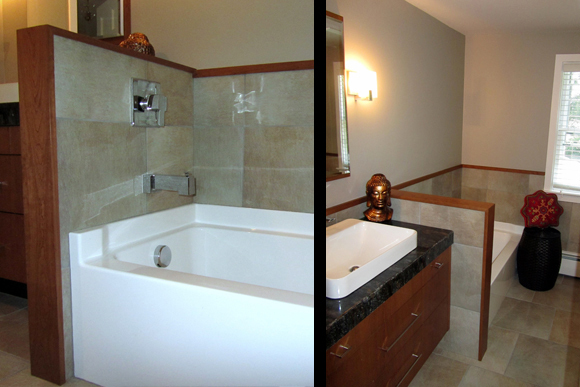 We won the Lancaster BIA Remodeler’s Awards of Excellence high end bath category this year. I had not entered a project since the late 1990’s and it feels good to be honored by my peers. Sandra called me a few years ago during the recession inquiring if I would remodel her mudroom; I came “highly recommended” by a friend. At over an hour from our office the job was too small to make sense. Lucky for me I decided to do it anyway. Not only were they wonderful clients, I have been back for three major projects as well as some smaller ones. Tom and Sandra bought a late 80’s suburban home several years ago. Their tastes run more towards industrial/urban contemporary than the typical banal traditional styling found in their home. 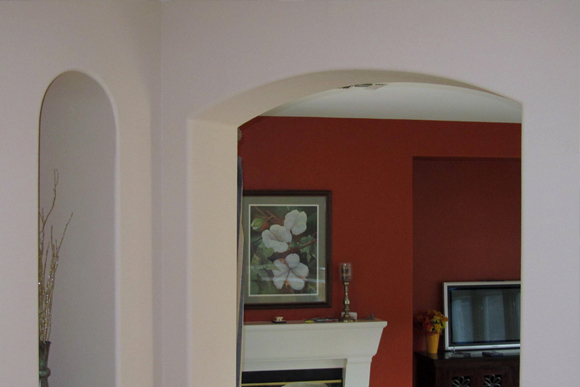 With each remodel we move the house towards their aesthetic. 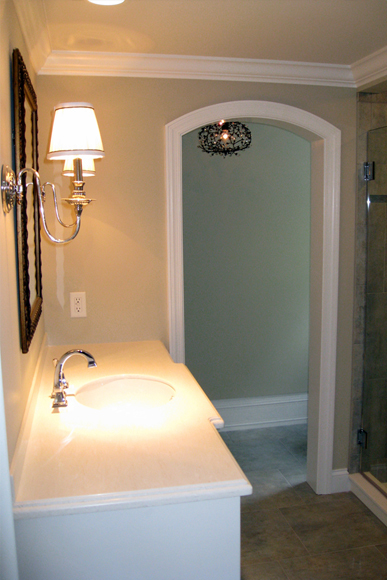 The master bath has a spa feel with soft colors on the wall and natural limestone on the floor and wainscot. The dark shower wall tile adds the “Urban” touch. 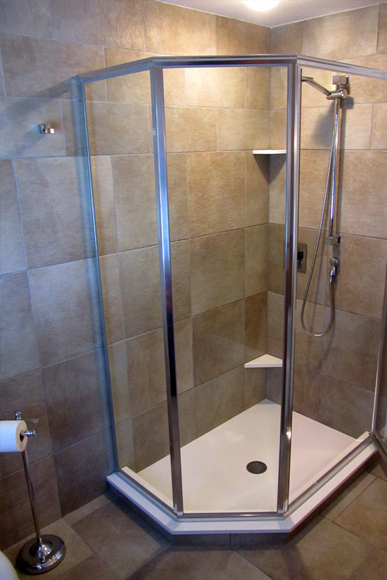 You enter the shower from behind the linen storage tower, the glass panel is fixed. 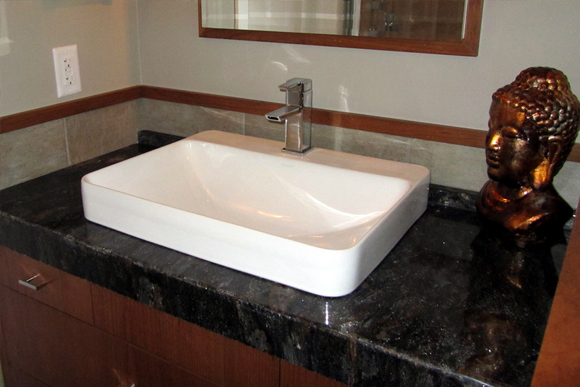 The bench is a floating piece of granite that matches the vanity tops. For the first time we installed an outlet specifically for a Sonos speaker (in the top shelf of the tower). The shower floor is flush with the room floor. 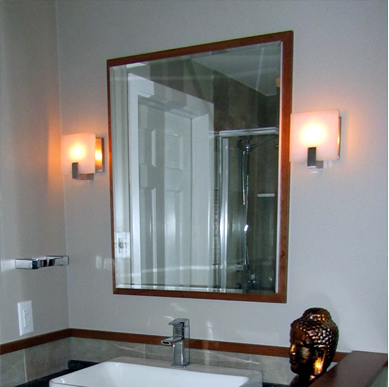 The entire bath floor is heated by a digitally controlled programmable thermostat. Sandra’s vanity features two banks of drawers, a tall linen cabinet, and a luxurious sit down make-up counter with a lighted mirror. The mirror is surrounded by white marble mosaic. There is a quad outlet inside the linen cabinet allowing all the hair equipment to stay plugged in. 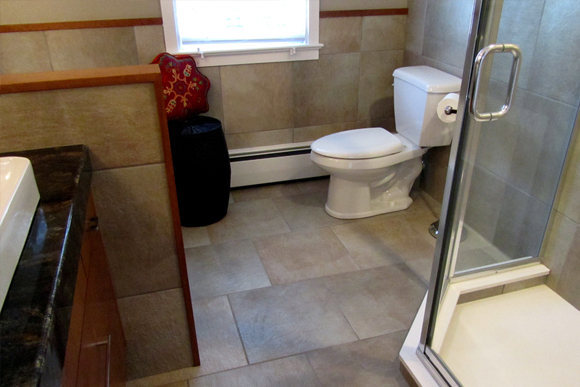 The “carpet” under the tub matches the shower floor as the shelf and wall cap match the vanities and “water closet” door; these matches give the room a flow that creates a calming effect. 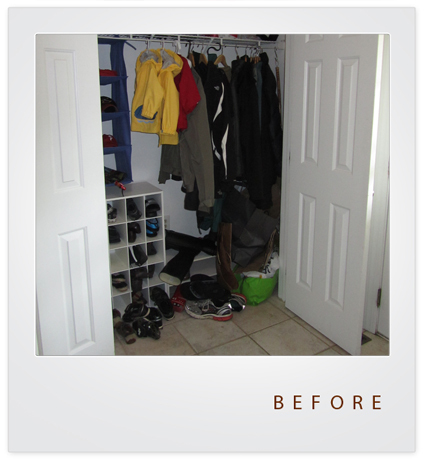 A barn door closes off the “water closet” which houses the toilet and a storage cabinet for cleaning products. Etched glass in the custom door allows natural light into the room while giving the occupant privacy. One of the unique design challenges of this space was too much square footage. In the initial design the distance between his and her vanities felt vast. The solution was a walk in linen closet. It doesn’t matter how good the room looks, if it does not work well, it is a failure. The existing room was neither, functional nor beautiful. 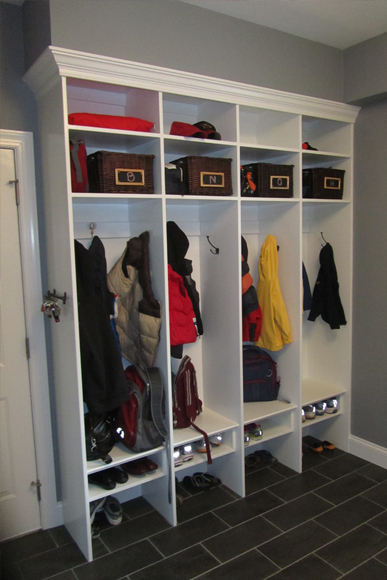 Imagine trying to get four young boys to hang their coats in here, at the same time. Not going to happen. The closet was removed. Children and closet doors do not mix well. The divider between each locker creates space for additional hooks generating more storage space than a flat wall with hooks. It also creates clear lines between each child’s “territory,” if you have had young children no explanation is needed. Note the key hooks on the end of the lockers, this should put an end to that constant last-minute search. We built a false wall to allow us to recess the new washer and dryer. 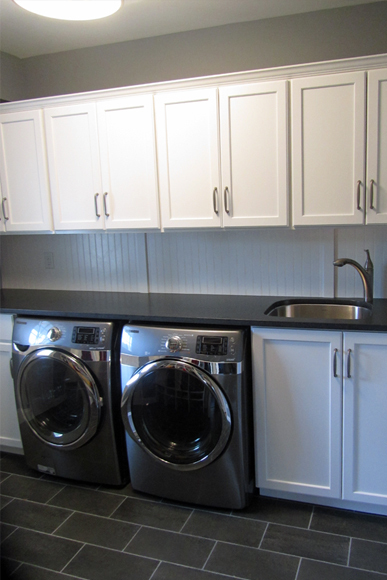 The custom base cabinets were built so that the new counter would clear the washer/dryer and allow a 10 foot expanse of counter for sorting laundry or doing school projects. The wall cabinets were re-hung although we did replace the doors with a simple flat panel that matched the base cabinets. It is wonderful to have a solid back-splash so you don’t lose socks off the back of the dryer. 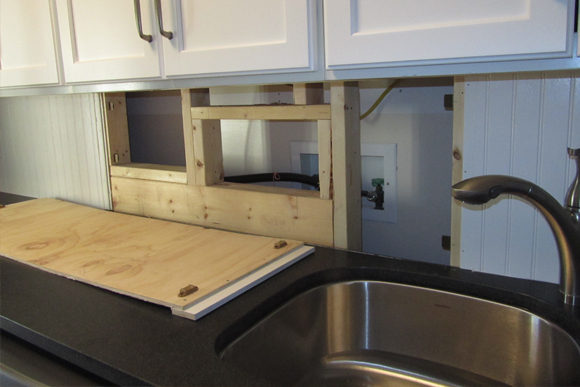 The center panel of the bead board is held in place by magnets to allow access to the water valves and electric plug. 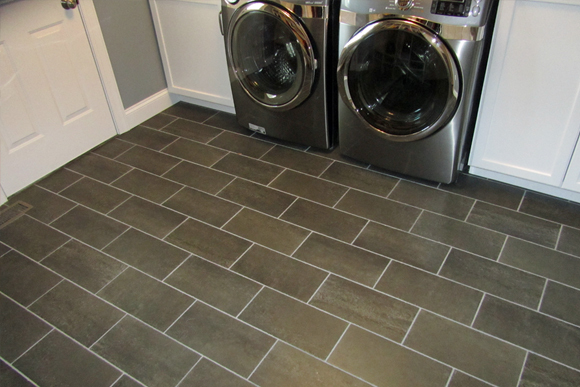 Rectangular shaped floor tile have been growing in popularity, here we laid them in a brick pattern. For the sticklers out there, I know that brick shape tile are not really new, the Romans used them in the days of the gladiators. The other new trend; Alternate finishes on granite counters. A few years back we started seeing honed finishes, these are matte finishes that are perfectly smooth. A honed finish completely changes the look of a piece of granite compared with its polished counterpart. Another new finish is leather, this finish has a little bit of texture (like leather) and again changes the look of a given piece of granite, it also gives it a “softer” feel. For this job we used a similar textured finish called “brushed” on premium black. 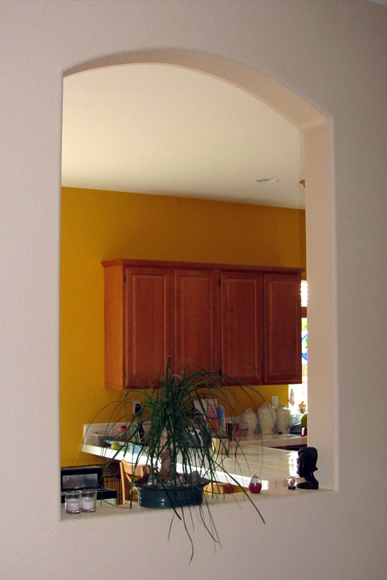 The second blog post I did back in November 2010 <Great Design “Bang for the Buck”>, described a custom kitchen design that kept an eye on the budget. The client called me back almost a year after I did the design and proposal and said they were ready to go. 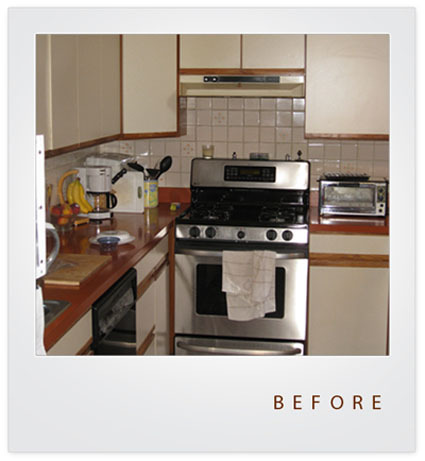 The project replaced an early 1980’s kitchen. The first thing you see entering the kitchen is the range wall, so that is where we spent the most money on design elements. If you are trying to get the most impact for the dollar spend your money at eye level. The drama is in the three cabinets surrounding the range. 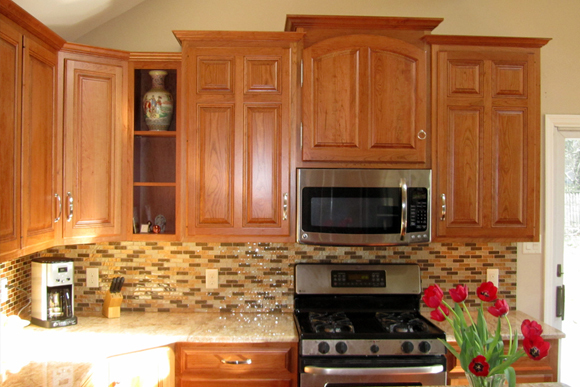 The wall of cabinets to the left utilize the same door panel style but in a single panel door. The panels on the island are a simple applied molding instead of a true raised panel. This saves considerable money but looks much nicer than a plain plywood back. To create symmetry around the range I added the little display shelf unit. The patio door dictated the size of the cabinets, which were an awkward size, too large to have a single door look nice, but too small for two doors. The solution; multiple panels in a single door. Those two cabinets are deeper than standard size to allow for more storage and to help with the proportions. 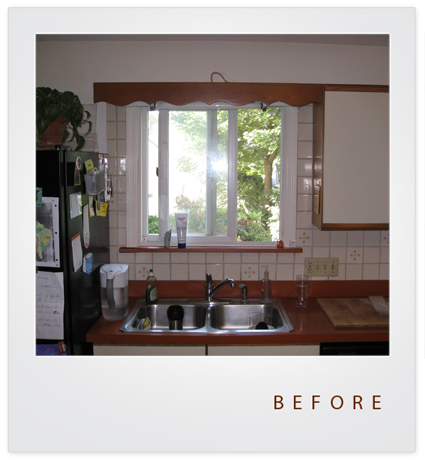 We lowered the sink window and then boxed it out 8” to create a deep sill. It always amazes me how much better it looks to bring the window down to counter height. The sink is huge. It is hard to tell in this picture, but the small sink is the size of a normal double bowl, the overall sink is 6” wider than a normal sink. Great for cleaning big pots. The painted board that sits on the granite is cellular PVC which will never rot. The big pull on the drawer doubles as a bar for a dish towel. Note the outlets on both sides of the island, one for the cook the other for the children’s laptops when they are doing homework. 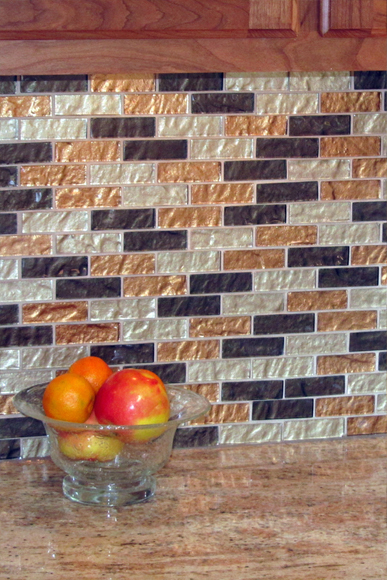 The glass tile back-splash adds a dramatic punch and a contemporary touch to the otherwise traditional kitchen. 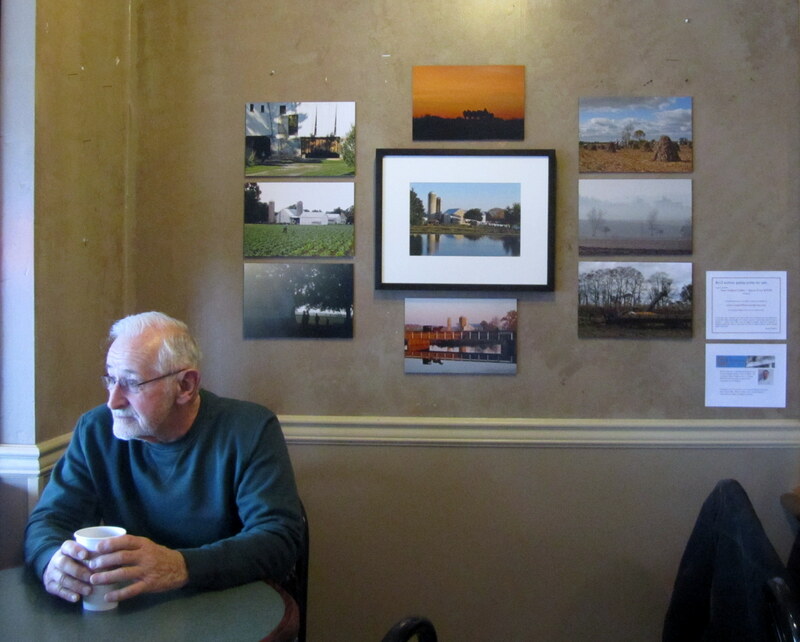 I am displaying my photography of Lancaster County at the New Holland Coffee Company for the month of March. Hang one of these pictures in your home, or the prints make great gifts! To see the full selection of images go to Casa de Piña and click on the “Lancaster County Images” tab. Straight lines and a contemporary color palette set this bath apart. Needless to say, Ginny was thrilled to lose the blue tile. 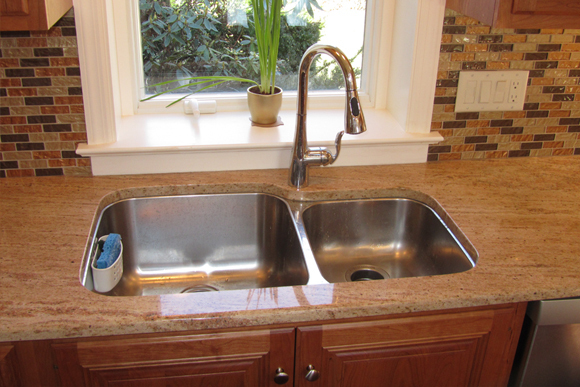 This sink combines the look of a raised vessel and cost savings of a drop-in sink that does not require a more expensive faucet. 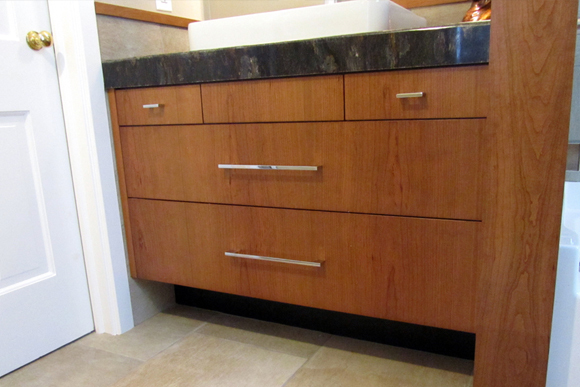 The vertical grain and 3” thick granite apron on the top are both inexpensive details that add punch to the look. 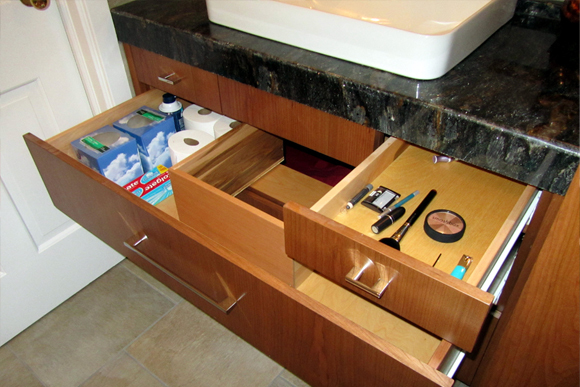 The “U” shaped drawer maximizes storage space inside while maintaining the clean lines of the vanity. 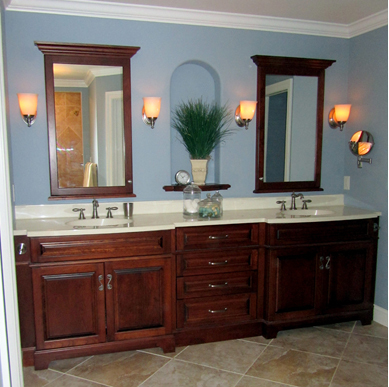 We capped the tile around the tub and vanity with the same cherry as the vanity. 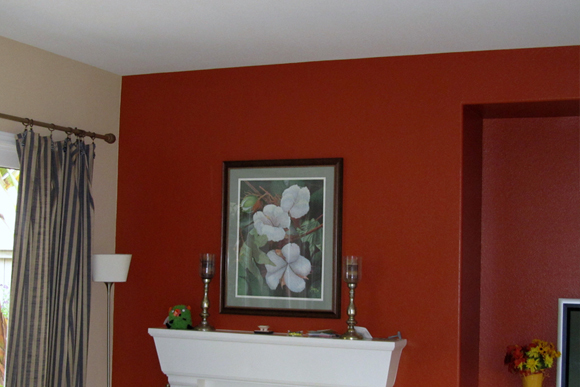 This helps create unity by carrying the cherry throughout the bath and is a much cleaner look than bull-nose tile. And, as an added bonus it is much less expensive. 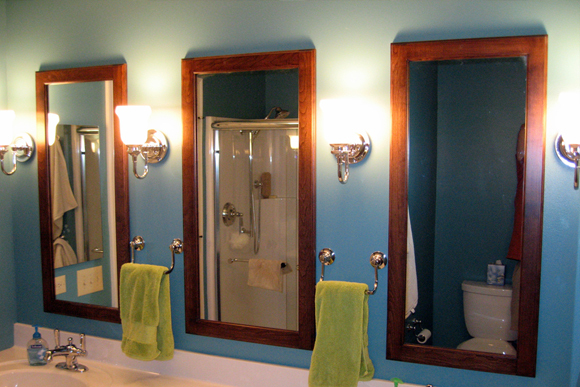 We framed a plain beveled mirror with cherry to match it to the vanity. 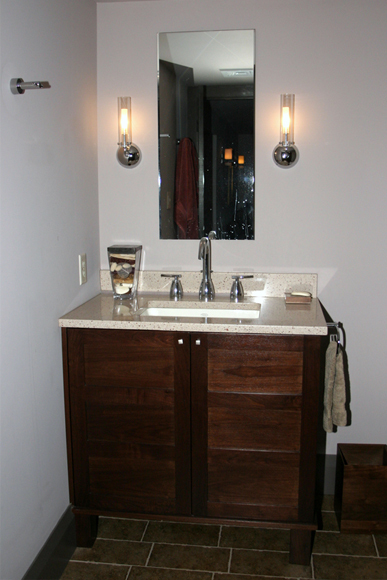 The square lights tie into the plumbing fixtures. 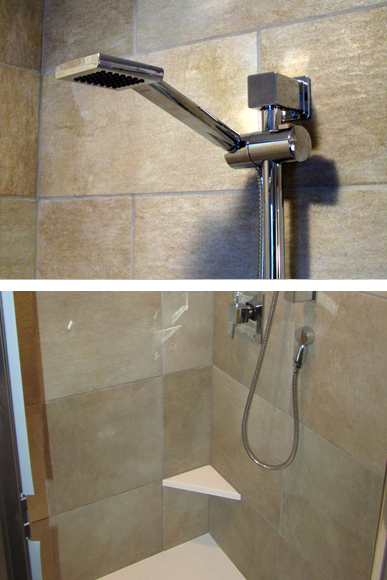 We chose to tile the entire wall behind the shower and toilet to make the room feel larger. Moen 90 Degree faucets throughout the bath. The low triangular shelf is there as a convenience to the ladies for shaving. If you will allow me, I would like to explain what a Greenhouse Germination Chamber has to do with your home. Several months ago we were called by the grower at a large, local greenhouse to build them a germination Chamber. At the greenhouse, after seeds are inserted into little soil pods they need a place to germinate. The germination chamber needs to have a constant temperature of around 70 degrees, 100% humidity and be brightly lit. The challenges, in this project are that wood does not like humidity, electric does not like humidity, A/C removes humidity, and metal rusts in humidity. The grower had toured some other facilities and brought us a design concept and material specs and asked us to price the construction of the space for their greenhouse in Smoketown. In the above sketch the outside walls are lined with vertical fluorescent lights mounted 8” apart. 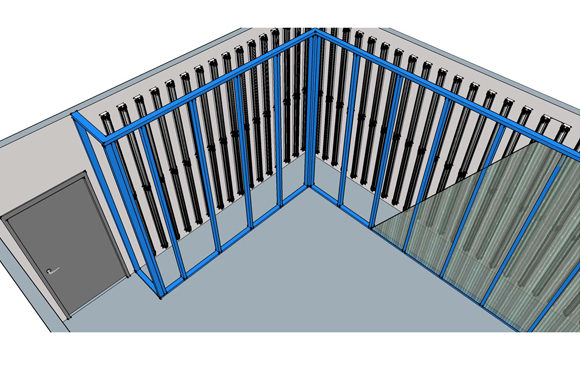 A second wall (in blue) is set 24” from the lights and sheeted with transparent polycarbonate panels. 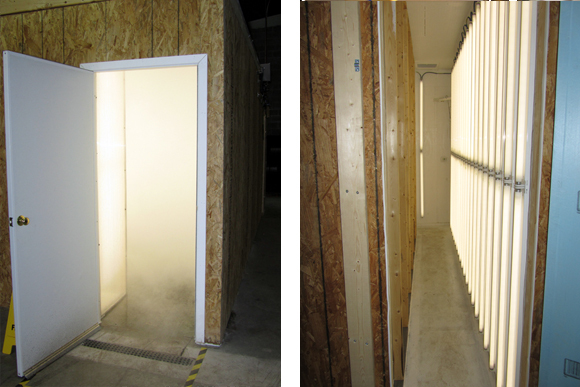 The interior of the chamber is sheeted with fiberglass panels. The 2’ space is air-conditioned. Several of the materials they had specced would not hold up well to the constant moisture conditions so we decided to re-design the project to stand up better to the moisture without breaking the bank. I called my commercial door supplier and priced a custom height fiberglass door in a metal frame, the quote $900, and we would still have a rust problem. So I called a pole building supplier, I described the conditions, they suggested a fiberglass door in an aluminum frame, that is used on poultry houses, their cost on the door $250. 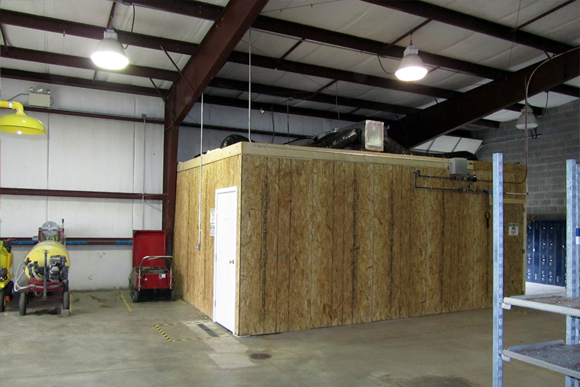 We replaced the specced OSB sheeting behind the fiberglass panels with residential tile backer board which is impervious to moisture. For the wall plates which would always be sitting in moisture we used composite deck boards. 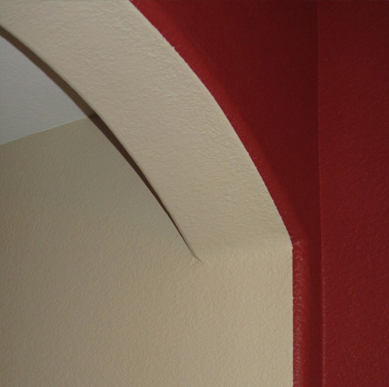 We combined, commercial, residential, and ag materials to meet the requirements and keep costs as low as possible. In the end there are none of the typical beautiful pictures of the completed project. Simply a box housing a unique mix of equipment and materials sourced from diverse suppliers, and a Very Satisfied Client. How does this apply to your home? With over 45 years of construction experience, we have done and seen a lot. That experience helps us to design and build in unique cost effective ways. 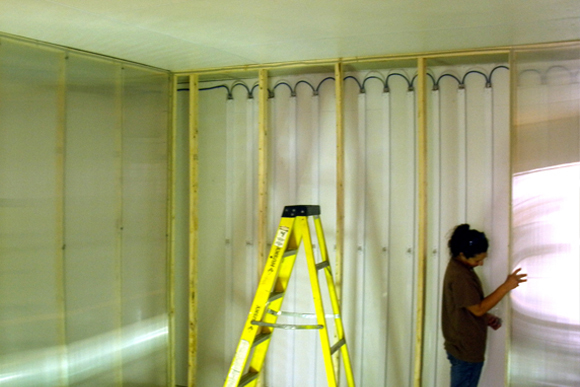 The Poly carbonate panels being installed on the chamber walls, with the fluorescent fixtures visible on the wall behind. When the room is fully operational all you see upon opening the door is a misty glow in the chamber from the lights on the other side of the wall. The ideal lighting at a bathroom vanity uses a light on each side of the mirror, the crossover of light eliminates shadows allowing you to see well for make-up application and shaving. The worst lighting at a vanity is the single overhead spot which casts horrid shadows under your eyes, nose and chin, not attractive or functional. In this bath with the shades cutting down on the brightness of the sconces we used an overhead spot to supplement and add a nice accent on the bowl. Note the dramatic fixture in the adjacent space lighting the water closet. In this contemporary bath we used pendants to provide the side light and pin spots from above to highlight the granite vessels. 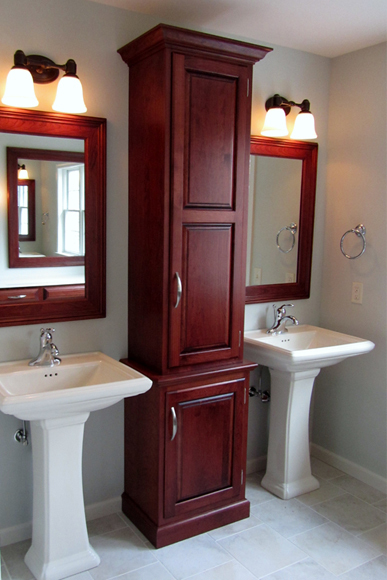 This vanity is large enough for two generously sized medicine cabinets an accent niche and ample room for four sconces. 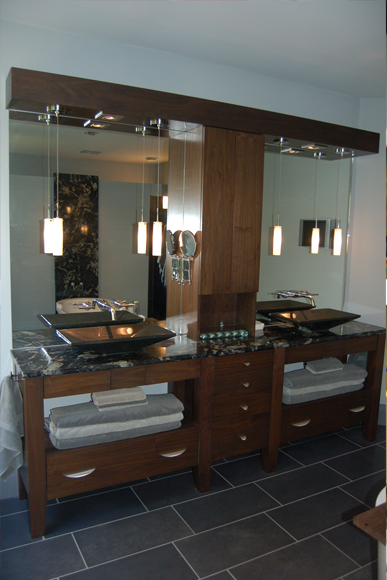 Space for two sconces is often a challenge with narrower vanities, for this 36” vanity we used a tall thin fixture along with a narrow mirror. Of course every design rule has exceptions. Here we did not have the width for side sconces and the cabinet in the center. The wife has a separate make-up table, and the husband shaves in the shower, so they chose the storage over the lighting quality. 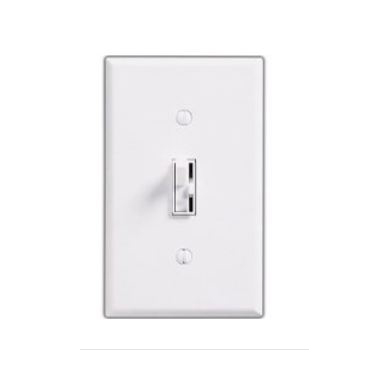 The other little feature we always include on bathroom lights is a dimmer, I hate being blinded first thing in the morning. We have had great success with Ariadni dimmer from Lutron, it is simple, inexpensive (around $15) and reliable, it functions like a normal switch and the little slide along the side sets the brightness level.